When choosing the best hold down method for your CNC application, it is important to evaluate the benefits of using a CNC vacuum bed. Vacuum systems provide hold down force during many processes, keeping various substrates and materials firmly in place during applications such as cutting and grinding. Critical applications which utilize computer numerically controlled (CNC) processes require the dependability and reliability that quality made vacuum beds provide. The material used in the process and the thickness of the workpiece or substrate. Thin or flexible materials may require the use of a sacrificial sub-plate during cutting applications. The flow of material including products that are cut out of a workpiece and the remaining scrap pieces of substrate left after the process. Changeover requirements including how the workpiece is removed and what preparations are necessary for the next operation. Knowing the answers to these questions will help to provide the best hold down solution for your application. Many commercial and industrial processes are realizing the benefits of CNC vacuum beds over other traditional methods. During the early days of CNC machining, most materials were held down with various clamps, jigs or literally screwed down to the work table. While this may hold the substrate squarely in place, it does not provide all over hold down force and will allow for some slippage. These traditional methods may have been the best solution at the time, but they still allow some movement during CNC cutting processes. This slippage during cutting could cause product damage and also poses a safety hazard to employees. Clamps and screws may not be very conducive to quick changeovers. When choosing the best hold down method and evaluating various CNC vacuum bed solutions, it is important that you develop a plan based on your substrate specifications and application goals. Reduced cycle times – with reliable, consistent vacuum force where and when you need it, your process is quicker and much more cost efficient. Reduced cycle times are a direct positive impact to the bottom line. Quick changeovers – with the ability to turn vacuum force on or off, quick changeovers are possible. Increased productivity – quick changeovers allow for increased production which significantly improves productivity and profitability. Customization – vacuum tables can be designed around your process, in varying shapes and sizes with custom designed hole patterns and zones. Versatility – vacuum systems provide all over hold down force, allowing for versatility with varying materials and processes. Improved quality – reliable hold down force with consistent flatness improves process and product quality. Improved profitability – increased throughput and quality greatly improve the profitability of CNC and any manufacturing application. With all these benefits, it is advantageous to explore the use of quality built CNC vacuum beds for your application. Let the vacuum table specialists at Systematic Automation evaluate your process and show you how a vacuum system will provide these benefits and many more. Systematic Automation offers more than 35 years of experience in designing, engineering, manufacturing and installing quality built CNC vacuum beds which greatly improve operations. We set the industry standard with +/-.001” consistent flatness per linear foot, with a wide range of sizes and customized solutions available. Our standard vacuum tables range in size from 5” x 6” at 1 3/16” thickness, 48” x 96” to 72” x 144” at 1.5” thickness for added durability. Systematic Automation offers these features and many more with vacuum systems designed around your process. Our engineers possess in-depth knowledge of vacuum technology and automated systems which provide cost saving efficiencies. 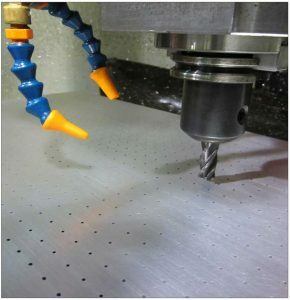 When searching for the best hold down method for your CNC process, consider the many advantages of a CNC vacuum table. Systematic Automation is a recognized leading manufacturer of high quality automated equipment including vacuum tables, screen printing machines, UV curing and flame treatment equipment. All equipment is manufactured in our modern, U.S. facility and tested for quality performance prior to shipping. Contact us today to learn more about improving your process with CNC vacuum beds.